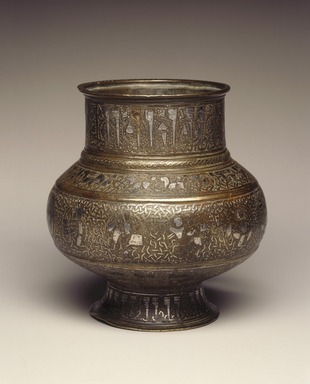 Inlaid with silver, chased and engraved; decorated with inscriptions in animated naskh script, figural, geometric, and zodiac designs. Brass, inlaid with silver, chased and engraved. It has a high, wide neck, bulbous body, flaring foot, and although the handle is missing, this jug is the finest metal object in the Erickson Collection. It has six horizontal bands of various widths with epigraphic, figural, and geometric embellishment. There is an Arabic inscription in human headed "naskhi" (cursive) script, around the neck, which reads: "Glory, success, dominion, safety, happiness, care, and long life to the owner". On the foot there is another human-headed "naskhi" inscription with two variations on the first (the order of the words for safety and happiness is reversed and the word "intercession" replaces "care". The tops of the human heads are flat and their hair is depicted by a horizontal line across the figures' brows. On the shoulder of the jug run two bands consisting of cheetahs, dogs (?) and rabbits chasing one another. The narrow band between the lower animal frieze and the foot consists of a geometric interlace, punctuated by roundels containing harpies, common on 12th and 13th century Iranian metalwork. The main decorative band in the middle has the twelve signs of the zodiac in roundels with geometric interlace.